Postcard-perfect beaches, balmy weather, lush greenery – the Maldives is an archipelago that virtually everyone wants to visit. And that’s very conservative on my part, I think; I mean, if money was no object, who wouldn’t come here? Most of the time, all you hear about is its beaches and luxury hotels; its diverse culture, meanwhile, is rarely mentioned. Today is the day that changes, however, as culture is going to be the focus of this post. If what you read inspires you and you decide to sort out the practical details of your holiday right away, such as finding a hotel, just do a Google search for the Maldives and plenty of info will pop up. Any destination’s culture is largely shaped by its history, so when I tell you that the Maldives has a fascinating past under the rule of a number of countries and suffused in myth, you should recognise that now is the time to get excited. The first thing to know is that the islands of the Maldives dot the trading route of the Indian Ocean – something that has meant that visitors from far and wide having been coming here both in the form of short stops and of settling for centuries on end. So, the country is no stranger to overseas influences, which have made their impact on the culture over the years. Just to give you an idea of what influences are at play, the original settlers here belonged to the Buddhist faith, but the nation converted to Islam back in 1153. In 1558 the Portuguese invaded, before being forced out in 1573. The archipelago then became a protectorate of Great Britain in 1887, gaining independence in 1965. In 1972, the first-ever island resort was built – a real landmark when you think how important local tourism is now. So, you now have a (very) broad outline of the Maldives’ history, which means it’s time to look more directly at what you’ll experience in terms of culture. We’ll begin by taking a quick look at things like language, which you’ll come into contact with as soon as you arrive. The national tongue is Dhivehi, but you’ll find the dialect can vary depending on whereabouts you are. For instance, on the inhabited islands in the far south you’ll notice a distinctly different dialect from places like Male’ – something that’s often attributed to the former’s relative isolation. If you go island hopping, expect to discern differences in people’s appearances from one atoll to the next. This is down to the Maldives’ trade route location, which saw peoples from places like Africa, Arabia and south Asia settle here. So, it’s easy to see the country is something of a melting pot. What I like doing is exploring the local arts and picking out different slices of heritage – as well as seeing how these diverse elements come together to create something new. For instance, head into a mosque and you’re likely to see intricate patterns on the wooden beams, which can be traced back to south-east Asian influences. In terms of music, keep your eyes (and ears!) peeled for the bodu-beru, which is like an African drum. 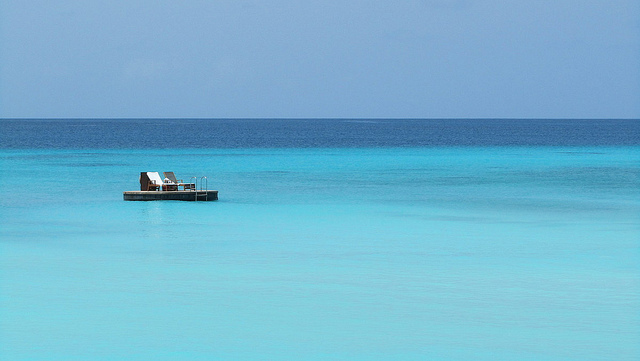 Go island hopping, meanwhile, and you’re likely to do so in a dhoni – a traditional Maldivian boat. Look closely, though, and you’ll see it looks very similar to an Arabian dhow.